Promotional watermelon lip shimmer w/white tube cap is just amazing and it can help you to overcome heat of summer. 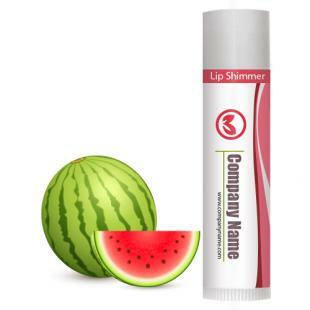 This lip shimmer mimics coolness and freshness of rich, juicy and delicious watermelons, when rubbed over lips. It can spark a riot of silky and happy smile- free from pains, scars, and other infections caused by weather. Health Quotient –Cruelty –free. Includes various natural and synthetic moisturizing ingredients vitamin E, beeswax, coconut oil, light mineral oil and aloe oil. Harsh manipulators such as taste enhancers, quality enhancers, and quantity enhancers - avoided. PABA free. FDA approved. Directions – Apply watermelon legacy lip shimmer over bare lips or along with lipstick or other lip make up. This lip shimmer is not developed to act as a moisturizer on any other parts of face or body. Gifting Favors – Promotional watermelon lip shimmer makes an enriching gifting choice during summers, when lips throng for a cool and soothing touch. Marketers who wish to gift away happy, chap free and scar free smiles during summers can easily rely on this lip shimmer.